2. Причастив настоящего времени (Participle I). In modern supermarkets and mass merchandising outlets, products seem to sprout from the shelves like mushrooms overnight. Nowhere is this more evident than in the frozen and refrigerated supermarket cases where attractive new products are the order of the day. The consumer takes this horn of plenty for granted, rarely considering the technological wizardry that makes many of the most useful and exciting products possible. Old and new, big and small, following is a handful of freezing and refrigeration-related technologies that have opened the floodgates of possibility to food makers. While freezing is a key part of the process, it turns out not to be the method of preservation in the backward world of freeze-dried foods and their three-stage metamorphosis from fresh to frozen to shelf-stable. Freeze-dried products can be amazingly fresh-like when rehydrated. Freeze-dried shrimp plump up like a freshly cooked sea critter and look just as good as their freshly caught cousins on the rim of a cocktail bowl. Freeze-dried fruit and vegetables of comparable quality have been around even longer. The first freeze-dried product was a strawberry created for cereals. 1. What modern supermarkets have a big variety of products? 2. What makes many of the most useful and exciting products possible? 3. Freezing is a method of preservation, isn't it? 4. How many stages are there in metamorphosis of freeze-dried foods from fresh to frozen to shelf-stable? 5. How do freeze-dried products look like when rehydrated? 6. What was the first freeze-dried product? 7. How often do new cereal products containing freeze-dried fruit arrive? 8. Продукты из хлебных злаков. Freeze-drying involves sublimation, a process you learned in high school science and likely thought little about since. Product is first frozen at low temperature and then placed under vacuum. This is where the sublimation takes place. The process evaporates the ice. The ice crystals pass into the gaseous phase without first becoming liquid. Applying heat at the proper stage accelerates sublimation Low temperature condenser plates remove the vaporized ice crystals from the vacuum chamber by converting them back to a solid. Individually quick freezing (IQF) is technology that has dissolved into the invisibility of the consumer's everyday expectations. Before the advent of IQF, frozen fruits, vegetables and seafood often came frozen in lumps. Freshness, taste, and product integrity suffered for the cause of preservation Frigoscandia Equipment, today a Northfield, Minn., unit of FMC FoodTech, introduced the technology with the FloFreeze IQF freezer, and it has changed the image of frozen food quality ever since. This revolutionary process eliminated blocks and frozen clusters of product. It enabled processors to clean, trim and freeze-in the nutrients of fruits and vegetables sometimes within hours of harvest. The process arrested the natural degradation process, making the frozen product at times superior to fresh. The drying of products in the chemical and allied industries is not a final step presenting little difficulty. In many manufacturing processes drying is the final operation but it is not only a matter of removing moisture. Prevention of the physical appearance of the dry product frequently is of great importance and determines the drying method selected. In many cases the nature of the product is the controlling factor; for example, in drying food products the effect of the drying process on proteins, carbohydrates, fats, sugars, enzymes or vitamins may be the deciding factor, rather than economy of heat or first cost of equipment. The procedure varies with the product - its physical qualities, degree of wetness, and value. Each group of materials has its own class of driers. Liquids containing dissolved solids and thin slurries carrying suspended matter are usually handled in drum or spray driers. Sludge and pastes may be mixed with dried materials until they crumble, and this mixture is then dried like solids. Wet solids are frequently dried in rotary driers, cylinders lying lengthwise, through which a current of heated air or flue gases travels. Compartment driers are closets or even rooms in which the material is spread on trays or in shallow pans; in the drying of dyes, for example, the same pan may be used for given colour exclusively. Separate pans are used for different colours, but the drier itself may be used for all. The operation is discontinuous; in order to make it continuous, the pans may be placed on trucks traveling on rails, and these are pushed through a tunnel in which warm air circulates. The belt drier and the chain drier are efforts in the same direction. 1. What does freeze-drying involve? 2. Where does the sublimation take place? 5. Did IQF make a good influence on frozen food? 6. What is the final operation in many manufacturing processes? 7. In many cases the nature of the controlling factor, isn't it? 8. What is the deciding factor in drying food products? 9. Does each group of materials have its own class of driers? 10. What types of driers do you know? 2. Дополните предложения словами и сочетаниями из текста. 2. Product is first frozen at... temperature. 3. The ice crystal pass into the... phase. 5. The process of IQF arrested the ... process. 6. The process of IQF makes the ... superior to fresh. 8. Liquids containing dissolved solids are handled in ... driers. 9. Wet solids are dried in ... driers. 10. ... are closets in which the material is spread on trays. It consists of rotating cylinder inclined to the horizontal, with material fed to one end and removed from the opposite end. Drying is accomplished indirectly, heat is being conducted to the material through the metal shell or tubes, or through cylinders placed in the rotating shell. The simplest type of this dryer consists of a rotating cylinder encased in a brick or steel housing that is also the combustion chamber. Flights are used on the main drying cylinder and on the outside of the inner hot-air duct. Moisture vapor usually leaves at the feed end of the drier through a stack or an exhauster. In another type, hot gases pass through an inner concentric fluted cylinder and then back through hollow flights attached to the outer cylinder. The most common type of indirect rotary dryer is the steam-tube dryer. Steam-heated tubes are fastened symmetrically in one, two or three concentric circles to the inside of the cylinder and rotate with it. When the materials are sticky, only one row of tubes is used. Flights are sometimes used to promote agitation of the material. Wet material may enter the dryer through a screw conveyor or gravity chute. The product discharges from the dryer through peripheral openings in the shell. 1. Перепишите следующие предложения. Подчеркните в них сказуемые. Определите их временную форму и залог. Переведите предложения на русский язык. a) Heat is being conducted to the material through the metal shell or tubes. b) The product discharges from the dryer through peripheral openings in the shell. 2. Найдите в тексте предложение с модальным глаголом. Выпишите и переведите его. Подчеркните сказуемое. 3. Выпишите из текста предложения с Participle IІ. Подчеркните Participle II и определите его функцию (определение, обстоятельство). Переведите причастия на русский язык. 4. Поставьте вопросы (четыре) к тексту: общий, специальный, альтернативный, разделительный. a) What does an indirect rotary drier consist of? b) What is the common type of an indirect rotary drier? Driers may be divided into two main groups: the first one comprises all the driers in which the material is in direct contact with the heating medium; the second group includes the driers in which material is separated from the heating medium by a wall. The heating medium for the first group may be hot air or flue gas; for the second group - steam, hot water, or flue gas. Each group may be subdivided into driers for liquids and for solids and those with or without agitation. Classification of the various types of drying equipment which has been given is based on the method of transferring heat. Driers of similar design generally can be found in both divisions. This classification does not serve as a guide in selecting a suitable drier for a specific product. For this purpose an alternate classification is offered which is based on the nature of the material handled. 2.Выпишите из текста предложения с модальными глаголами и переведите их. 3.Выпишите из текста предложения с Gerund и переведите их. a) What two main groups of driers can you name? b) What could the heating medium be? c) On what method is classification of drying equipment based? 1) Страдательный залог (The Passive Voice). 2) Причастие настоящего времени (participle l), причастие прошедшего времени (participle II). B. Impact of refrigerator on lifestyle. A refrigerator (often called a "fridge" for short) is a cooling appliance comprising a thermally insulated compartment and a heat pump - a mechanism to transfer heat from it to the external environment, cooling the contents to a temperature below ambient. Refrigerators are extensively used to store foods which deteriorate at ambient temperatures; spoilage from bacterial growth and other processes is much slower at low temperatures. 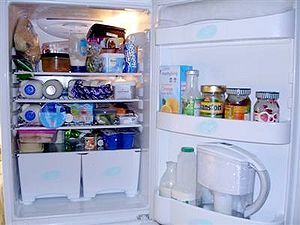 A device described as a "refrigerator" maintains a temperature a few degrees above the freezing point of water; a similar device which maintains a temperature below the freezing point of water is called a "freezer". The refrigerator is a relatively modern invention among kitchen appliances. It replaced the icebox, which had been a common household appliance for almost a century and a half prior. For this reason, a refrigerator is sometimes referred to as an "icebox". Freezers keep their contents frozen. They are used both in households and for commercial use. Most freezers operate around minus 18 °C (0 °F). Domestic freezers can be included as a compartment in a refrigerator, sharing the same mechanism or with a separate mechanism, or can be standalone units. Domestic freezers are generally upright units, resembling refrigerators, or chests, resembling upright units laid on their backs. Many modern freezers come with an icemaker. Commercial fridge and freezer units, which go by many other names, were in use for almost 40 years prior to the common home models. They used toxic ammonia gas systems, making them unsafe for home use. Practical household refrigerators were introduced in 1915 and gained wider acceptance in the United States in the 1930s as prices fell and non-toxic, non-flammable synthetic refrigerants such as Freon or R-12 were introduced. It is notable that while 60% of households in the US owned a refrigerator by the 1930s, it was not until 40 years later, in the 1970s, that the refrigerator achieved a similar level of penetration in the United Kingdom. 2. A device described as a "refrigerator" maintains a temperature a few degrees above the… of water. 4. Many modern freezers come with an…. 5. Commercial fridge and freezer units used toxic…, making them unsafe for home use. The freezing point, ammonia gas systems, a heat pump, icemaker, kitchen appliances. 1. What is a refrigerator? 2. What are refrigerators used for? 3. Why is a refrigerator sometimes referred to as an “ice-box”? 4. Where are freezers used? 5. When were practical household refrigerators introduced?